NIAGARA-ON-THE-LAKE — Walking into the Grand Victorian mansion is like taking a glorious step back in time. Located on the scenic Niagara Parkway in Niagara-on-the-Lake, the spectacular Victorian mansion with its Queen Anne Revival influence has been lovingly restored from its roots back to1875 and reflects the opulence and grandiose style typical of the era and owners’ wealth. The grand entrance reveals 12-foot ceilings, stained glass windows and myriad roaring fireplaces. The original arts and crafts architectural style woodwork includes an oak Chippendale staircase descending into the great hall with the original and ornate oak ceiling. 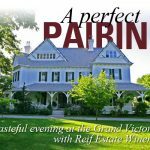 The mansion is set on 1.5 acres of gardens, surrounded by the vineyards of the Reif Estate Winery, across from the Niagara River. Today, the Grand Victorian is owned and run by Eva Kessel, who has spent considerable time lovingly restoring the grand estate back to its original condition. She operates the home as a guesthouse with six suites that are rented out at rates up to $225 per night. Kessel also enjoys a close relationship with Reif Estate Winery and conspires with the winery on weddings and special occasions in the fine dining facilities at the mansion. The mansion and the wines from Reif Estate is what brought 35 guests together recently to enjoy the magical winter pairings of Wine Country Catering chef Robin Howe’s creations matched to wines chosen by winery president Klaus Reif and winemaker Roberto DiDomenico. 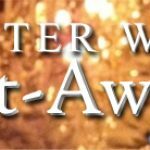 The theme was icewine, with each dish incorporating that lush, sweet elixir in some form or another, and matched to table wines chosen by Reif and DiDomenico. The challenge put to the chef and winemakers was a daunting one. First, how to cook with icewine in each dish, from hors d’oeuvres to starters to entrees and desserts and what wine from Reif’s substantial portfolio to pair with the food. The evening started with a homemade sparking icewine cocktail, a concocted blend of icewine and sparkling wine that is something DiDomenico wants to make commericially in the coming year. It was a deliciously sweet and bubbly treat that worked well with Howe’s icewine cured salmon gravlax on Yukon gold potato bilini with crème fraiche and icewine custard. Other nibbles, such as skewered shrimp wrapped in pancetta and Thai basil with a chili-icewine glaze and mini sausages with icewine grainy mustard, were served with the new Reif Sauvignon Blanc 2010 ($15) with grapefruit, citrus and grassy-green notes that paired brilliantly with the icewine-inspired starters. But it was the main event that brought folks to the $130 per person event. We were summoned to one of two grand dining rooms, extravagantly decorated in icewine-inspired motive and comfortably bathed in the warm glow of candlelight. The room was radiant and took us back to more elegant times when the main meal was an elaborate affair best shared with friends around a big family dining table. It was a perfect setting on chilly winter’s night in wine country. Our first course was a pan-sauteed filet of Ontario pickerel with a shellfish mélange in lobster saffron butter sauce spiked with Rief Icewine. The wine chosen for the pairing was the Reif Chardonnay Reserve 2009 ($20), with ripe apple, pear, pineapple and sweet spicy oak notes. The grapes for the Reif reserve wines, explained DiDomenico, are taken from the oldest vines on the estate, which yield less fruit but make wines with more intensity and richness. I noted a touch of toasted spice and butter in the wine that played well with the fish and seafood and was exceptional with lobster and saffron. The sweet and subtle icewine flavours added dimension to the dish. Our main was an icewine glazed confit of Muscovy duck on a lightly curried cauliflower and sunchoke puree, caramelized onions and brussel sprout leaves paired with the exquisite Reif First Growth Pinot Noir 2007 ($50).